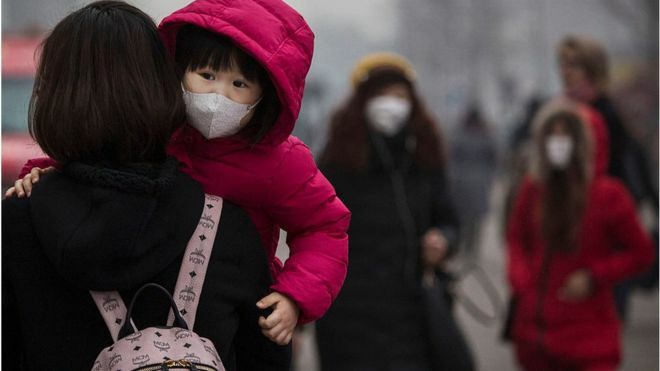 The air in much of China is so bad the government has repeatedly declared “war” on it. The enemy are tiny particulates which spew forth from countless cars, coal-fired power stations and steel plants to create a dense, putty-coloured smog. Beijing recently issued its first pollution ‘red alert’, closing schools, factories and construction sites, and ordering half of all private cars off the road. But these measures were only temporary. In a country where millions of people still look to industrialisation to lift them from poverty, what can China do to clear the air for good? Dr Jim Zhang, is a professor of global environmental health at Duke University and works in the US and China. “You can definitely smell the pollution. Your eyes itch, you cough. It’s like a very rich, dense soup when the pollution levels are very high: thousands of chemicals, gases that are irritants, carcinogens. “We have particles that have a diameter smaller than a virus. Human hair is very big compared to these. The larger ones will be deposited into the lung – that’s the biggest worry. But recent scientific evidence shows that when the particles are small enough they go into the bloodstream, they can go directly into the brain. “It’s very hard to get data to show whether the pollution is going to have a long-lasting effect, like a cancer, but there is a reason to believe that, because the pollution soup contains chemicals which can induce cancer. “It’s very frustrating to see pollution get worse after the huge effort which went into cleaning up the air in Beijing for the Olympics. “I did several studies demonstrating that if you do a temporary intervention to bring the air pollution down, [and] measure cardiovascular and respiratory health indicators in young healthy people, all those indicators significantly improve. “Women whose pregnancy was during those eight weeks of improved air quality got babies with a significantly higher birth weight, and we have a large database to show that in general if your birth weight is higher, your later life is healthier.